Tysheem Johnson was talking with his coach, Albie Crosby. He had just scored his third touchdown, and it was only the first quarter. “I think you could get six,” said Crosby. Thinking he was kidding, Johnson smiled. Crosby didn’t smile back. He was totally serious. 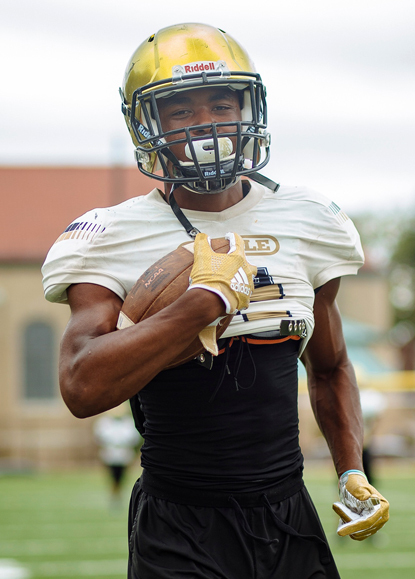 When the game was over and Neumann-Goretti High School had defeated visiting Bonner-Prendergast, 54-14, in a Catholic League Blue Division opener Saturday night, Johnson had indeed tallied six scores to pace the victors. Only a sophomore, Johnson had shown everyone why so many colleges have been salivating as they pursue the likeable all-purpose performer. On offense, he lines up everywhere. On defense, he plays mostly safety. On special teams, he returns punts and kickoffs. In establishing a school record for most touchdowns in one game, the 5-foot-10, 180-pounder had immediately put his name on the playground of social media. Johnson first reached the end zone on a short run. Then he intercepted a pass and returned it 52 yards for a score. He then scored on three straight receptions from junior quarterback Rausheen Lively, one of which, since it could not have been any longer, matched the all-time record for distance – 99 yards. He finished off his inspiring performance with an 80-yard kickoff return. Afterwards, his teammates playfully told him that his effort was worth a scholarship to football haven Alabama University. Johnson had company in the “wow” department. Lively completed eight passes for 264 yards and four touchdowns. Junior Malik Griffin gained 65 yards on 12 carries. Senior Tre’Sean Bouie notched three of the team’s five interceptions, returning one of them for a touchdown. He also snared a 64-yard strike. In other Blue Division play, West Catholic captured a 36-35 overtime shootout against Archbishop Carroll at Drexel University. In overtime, Carroll scored a touchdown on a three-yard run by senior Raphael Manning and junior Juliano Mastrocola added the extra point. West countered with a 15-yard TD pass from Hart-Hawkins to junior Julio DaSilva and a two-point conversion pass from junior Zaire Hart-Hawkins to senior Jacir Savoy. Undefeated Conwell-Egan (4-0 overall) beat Lansdale Catholic, 55-28, as the Eagles had three different players eclipse the 100-yard rushing mark in the same game – a school first. Senior quarterback Alex Goldsby (9 carries for 107 yards, two touchdowns), sophomore Dajuan Harris (15-110-2), and senior Patrick Garwo (10 carries for 114 yards, one reception for 54 yards, two touchdowns) all reached triple digits. Senior Terome Mitchell (one reception for 51 yards and a touchdown; fumble recovery for a touchdown) was a two-way force. Bishop McDevitt received 150 yards and a touchdown from sophomore Jon-Luke Peaker – his fourth straight game with 150 yards or more on the ground – in a 12-7 win over Cardinal O’Hara. Senior Zay Scott and junior Lonnie Rice provided key interceptions for the Lancers.